Almost everyone can identify the Big Dipper, but many don’t realize it’s actually part of a larger constellation known as Ursa Major (Big Bear). The Dipper is technically called an asterism — not a constellation. Its 7 bright stars are the easy ones to spot. The rest of the stars that make up the “bear” are difficult to see unless you have really dark skies. And even if you can see those stars, it’s a bit of a stretch to make out the shape of a bear. 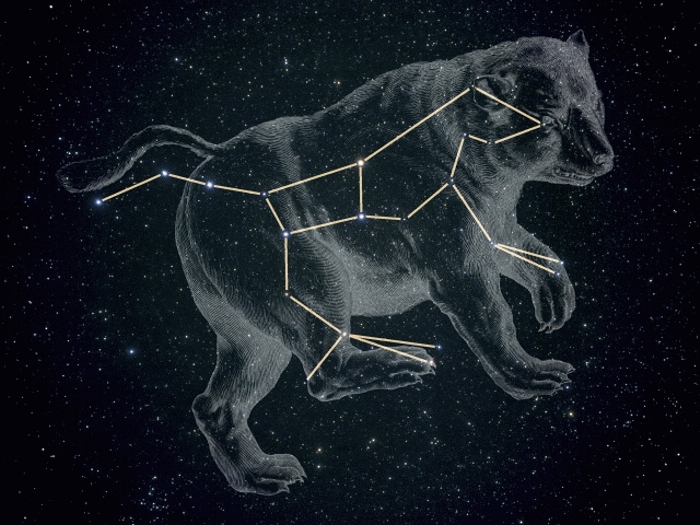 Nobody knows who first named Ursa Major, but Claudius Ptolemy listed it as one of 48 constellations in the sky charts he published in the second century AD. The night sky was a lot darker back then, so more stars were visible for making up human and animal shapes by connecting the dots. In Great Britain, the Dipper was called the Plough or the Wagon. In other cultures, additional stars were recruited to make other familiar shapes. For the Hopi tribe in the American southwest, the Dipper was Sootuvipi. Sootuvipi translates roughly as “star thrower” or “star sling.” The sling was a weapon used for hunting in many cultures, and the shape of the Dipper can be seen as a “sling” as well as a “ladle.” Sootuvipi is a circumpolar constellation in the northern hemisphere. That means it never rises or sets (as viewed from latitudes sufficiently far north). It simply revolves around Polaris (aka the North Star) as the hours of the night go by. Thus, Sootuvipi moves like a sling. I find it interesting how different cultures see different shapes in the sky. Every culture has its own mythology and icons, and the night sky provides a canvas on which fertile imaginations can draw. Something similar happens with the “man in the Moon,” which is seen as a rabbit by some east-Asian cultures. It’s a textbook example of pareidolia. Hopi sky lore also identifies shooting stars (meteors) as sohuluquu, which translates as “married star.” In the Hopi mythology, when a star gets “married” it falls to the Earth from its high place in the heavens. I’m not sure I like that imagery, but the Earth is a feminine Hopi deity that represents fertility, so I guess it makes sense at some level. 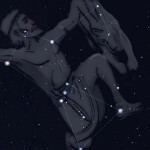 The three bright stars (left to right: Alnitak, Alnilam and Mintaka) in the belt of the constellation Orion didn’t so much form a shape to the Hopi, but they did represent an important ceremony called Lalquoont (which translates as “basket dance”). The three stars in a row are the three women who would line up to do that dance. 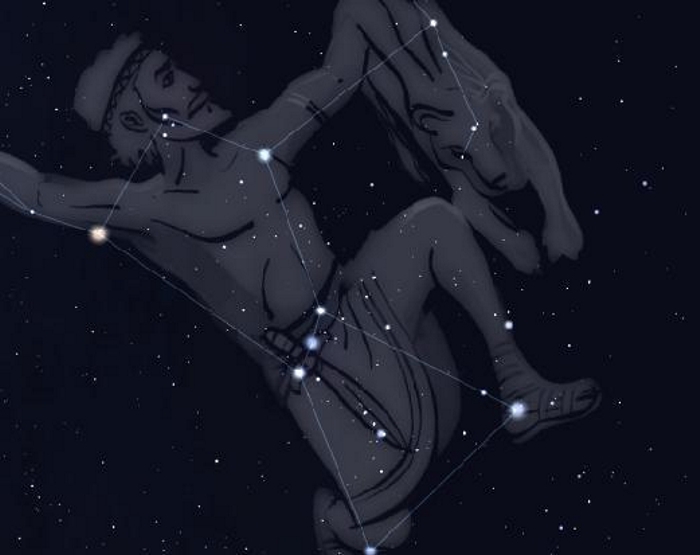 In Greek and Roman culture, Orion was “The Hunter” and included additional nearby bright stars to form a human shape. Click on the thumbnail below for a closer look (image courtesy of L’encyclopédie de l’astronomie). It’s probably worth noting that, regardless of where you are on the planet, the constellations all look the same. They are likewise constant over time — the positions of the stars do change, but it’s an extremely slow process. What early civilizations saw was essentially the same as what we see today. But in the contexts of specific cultures, imagination and myth gave rise to a fascinating variety of sky lore.